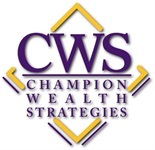 Champion Wealth Strategies works with you to customize a plan based on the full range of financial and estate planning issues you are likely to face now and over the course of your lifetime. We evaluate your overall asset allocation to ensure it matches your goals and your tolerance for risk. When you become a Champion Wealth Strategies client, we will work with you to develop strategies that can help you work toward your most important goals. It starts with a conversation where we will talk about your specific goals, needs, dreams and interest, as well as your entire financial picture. Only then can we match your short term and long term goals with your personal risk tolerance and investment timelines. As your priorities or global market conditions change we will help you find the best strategies to help ensure your long term strategies remain on track. Champion Wealth Strategies gives you the ability to organize all your advisors and assets and consolidate them in the same place at the same time. Imagine a single platform through which all your financial matters may be managed.